I think I am somewhere around the middle of the story mode of Batman: Arkham Origins, although it is tough to tell without looking up something spoiler-tastic. The Arkham games really are some of the best around. I am, however, becoming rather frustrated by the poorer quality control at WB Montreal (makers of this game) versus Rocksteady (makers of the first two). The little things are frequent. When gliding, I can get into an animation state where it looks like Batman is on a pogo stick. 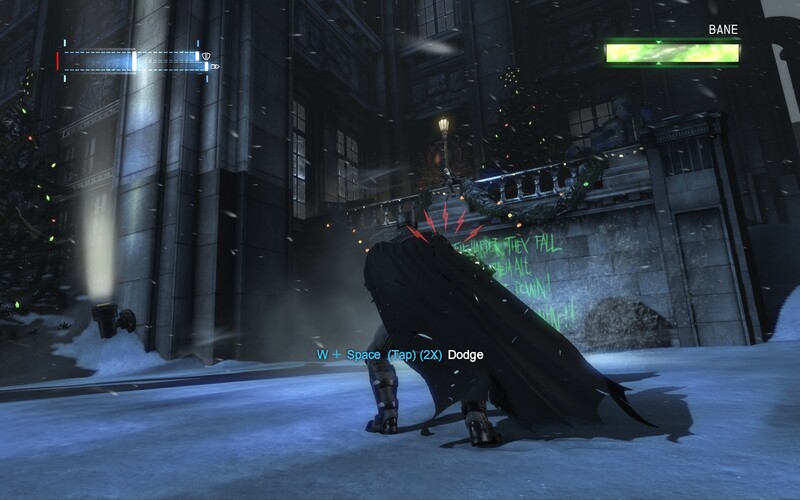 Batman’s walks along edges and railings are still subject to sticking, so that he hops up on a railing and only accepts the options of “dive off the building” and “hop directly in front of the guy with the gun.” There are have been several occasions where the game sticks or freezes up; these are moments when I look up what I am doing wrong, and in every single case it has been either (1) the game glitched, reload and it will probably work, or (2) no, that’s the right thing to do, you just need to be a few pixels over or a few milliseconds different on timing. That last can be frustrating because I am not entirely sure whether I am mis-executing something or if the game is reacting inconsistently. There are fights where I am absolutely certain that I am doing the same thing, because you need to do it six times in the same fight and I just did it, but the game seems to react differently to the same inputs. And combine it with the glitches, because sometimes the game just does not do anything, like the informer I could not interrogate because he lost the interaction prompt. I found the first Bane fight particularly annoying. There are a couple of quicktime events in the middle of cut scenes; I have no idea if it matters whether you succeed. Excitingly, the button for “punch” in a cut scene quicktime event is the same as the button for “punch” in a fight and for “skip” in a cut scene. Either one of the cut scenes for Bane was very short or I double-clicked for the last punch of the fight leading up to it, with the second click skipping the scene. The screenshot to the left is another “did you play this fight?” problem: a tip tells you to dodge, but the controls it suggests will send you directly into the attack. Maybe there is a perfect bit of timing that will let you dodge over the attack, but if you push the buttons the screen tells you to, you will dance straight at a charging bull. This is in contrast to the Deathstroke fight, which is oddly one of the first boss fights in Arkham Origins and the hardest fight in the entire series. Well, it is not so much a fight as a repeated quicktime event, where you time a lot of counters perfectly or you get hit in the face a lot. This is a fight where buttons produced inconsistent responses: sometimes, launching an attack works; other times, it leads to your immediately getting countered and damaged. Sometimes, you can get four hits in after blocking an attack, which reduces the number of quicktime events you must suffer through; other times, if you try for a second hit, the game decides you are being greedy, which leads to your immediately getting countered and damaged. I’m also just not sure about Batman beating Deathstroke. This isn’t a technical complaint about the game, more of a question of how a Batman too inexperienced to overcome doors is going to take out a guy sometimes described as “evil Batman,” where evil Batman planned the circumstances of the fight and comes with years of experience, mildly superhuman abilities, a healing factor, a sword, a gun, and explosives. I understand that this is not Identity Crisis Deathstroke, who single-handedly fought the entire Justice League, but I don’t think we’re giving the devil his due. This guy gets a seat at the big table with Black Adam and Lex Luthor; you have not represented him adequately in your game if the entire fight can be reduced to “right click to counter” and “left click to beatdown,” where both of those messages appear on-screen at the appropriate times. Although, as again with Bane, not the exact right times, so it’s a quicktime event where you cannot just push the button it says on the screen. Am I getting whiny? The requisite interface screw level is weaker than in the previous two games and includes sections where the camera shifts while you are walking across a beam, so the button that started you across the beam walking forward now sends you jumping off the side of the beam. This was also a stage where a glitch meant I needed to restart; the game kept animating, but I could not move or do anything. It failed to transition between scenes. Do you know how long you can keep trying to push buttons when then interface screw level glitches? Back to doors that may or may not be cosmetic and may or may not be locked (“I guess I’m coming back here later in the plot”), there are buildings and ledges that may or may not be targets for the grappling hook. They do not look any different, but you just cannot climb those parts. Like characters, the buildings can also have plot armor. And hey look, a huge structure in the middle of a zone that I cannot hit with the grapple — I guess I’m coming back here for a climactic fight later in the plot. Origins treats “predator encounters” somewhat differently. There are fewer stealth opportunities, and you can only use stealth productively in areas designated as “predator encounters.” If you hated those, good for you, this game has fewer, and you will already know how to beat them because of how closely most mirror bits of earlier games. There are so few that it may not be even theoretically possible to complete the “worst nightmare” track on one playthrough because you need the right kinds of predator encounters in the right order. I really like the stealth and stalking in the Arkham games, so this has been a disappointing change in the formula. Despite all this, Arkham Origins remains one of the best games I’ve played in the past year, which speaks well of the underlying fundamentals. Also, I am fond of what they have done with many of the characters. Young Barbara Gordon is a good one here. I considered making a comment the other day when I saw you say you’d bought Origins, but I figured the damage had already been done and you’d find out soon enough. My favorite bug was how often a building wouldn’t transition to the proper high-res LoD model when I was traveling across the city. Leaving me looking at an incredibly blurry looking building that couldn’t be interacted with in any way and in fact, had no collision. Leaving me to sail around on the underside of the map for a few seconds. Personally, I stopped playing just a little bit after the police station. I just had no interest in dealing with a dozen more hours of Joker-related wanking.